Britain's Jonathan Brownlee won silver in the Hyde Park Triathlon behind Spain's Javier Gomez as brother Alistair faded in the final sprint. The Brownlees, buried in the pack after the cycle, clawed their way back but, on home soil, could not match Gomez. 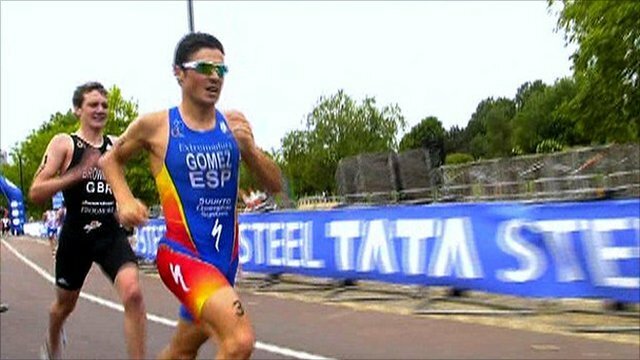 Gomez, who lost 2009's world title race to the elder Brownlee, set a time of one hour, 42 minutes and eight seconds. "This is a dream come true," Jonny told BBC Sport. Alistair was helped from the finishing line as he crossed in 10th. "I had nothing left, I thought I was going to come third," added the junior Brownlee. "I don't know what was wrong with my brother, he seemed to stop. He's an amazing athlete but that's what happens, it's a hard sport." Heather Williams, performance director of British Triathlon, said in a statement: "Alistair is fine but exhausted; there is no cause for concern." The victorious Gomez said: "I'm really happy, really proud. We were running pretty fast the whole time. "I felt really good last weekend [in Hamburg], I recovered well after that, and I'm flying, I'm really happy." The race, held in Hyde Park, is the fifth in the seven-strong World Championship Series. Alistair, 22, took the overall world title ahead of Gomez in 2009 but cannot defend his crown this year. International Triathlon Union (ITU) rules state no triathlete can win the series if they do not participate in either of the two races outside Europe - which were held in Sydney and Seoul earlier this year. Alistair Brownlee missed both through a leg injury after suffering a stress fracture and, even though he won in Madrid on his comeback, he is out of contention for the overall title. 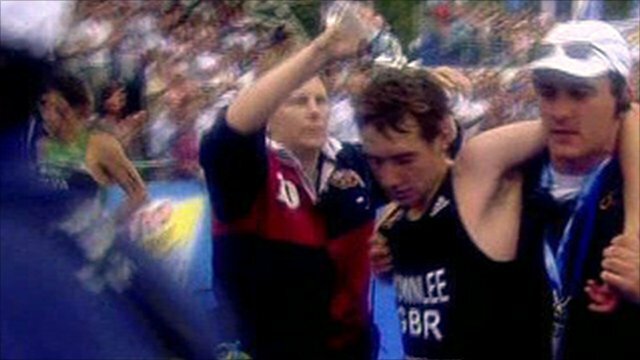 Not that Brownlee appeared to be letting that affect the remainder of his 2010 campaign as he launched himself into the swim with vigour. Brownlee battled through the pack to cross in second place at the halfway mark of the swim, and was leading by the time of the first transition into the cycle - with brother Jonny, 20, just behind. Both Brownlees had shares of the lead during the cycle as the lead group of cyclists failed to put much distance between themselves and the pack, meaning the favourites struggled to develop the time cushion they would like. British veteran Stuart Hayes made several bold attempts to drag the leaders on, with increasing success, and a seven-man group broke away in the latter stages of the cycle. Hayes and Portugal's Bruno Pais set out for the run in the lead, almost a minute ahead of the pack, and the trailing Brownlee brothers accidentally clashed in the transition area. That slowed down Alistair's transition but the pair were soon at the front of the chase and, remarkably, after the first of three laps they had caught and passed Hayes at the front. The Brownlees then broke clear alongside Spain's Javier Gomez as 2008 Olympic champion Jan Frodeno of Germany, who led the series standings going into the race, dropped off the pace. As Gomez pushed for the line, Alistair Brownlee dramatically fell away and was clearly spent as he dramatically collapsed over the line, well after Jonny had wrapped up silver ahead of Frodeno. "I tried to do a few attacks in the bike but it wasn't really working," added Jonny. "I took it easy in the last four laps, set off for the run and found myself at front which was a shock for me." Brownlee was kept in a medical tent to receive fluids after the race, but is expected to make a full and quick recovery. Hayes eventually finished eighth, passing Brownlee in the final metres of the race. Among other Britons, Tim Don came 13th, Will Clarke 20th and Olly Freeman 38th. Hyde Park will be the venue for the Olympic triathlon events in 2012. Swimmers complete two circuits of the Serpentine lake before cycling and running through the park in that order. This year's course is a slight adaptation of the anticipated Olympic route, as road closures for the Games cannot be replicated in the years preceding 2012. The World Championship Series will conclude with a race in Austria in mid-August, before the finale in the Hungarian capital of Budapest from 8-12 September. The series returns to Hyde Park in 2011 - it has been announced the London leg will be staged on 6 and 7 August.